In our last episode, we talked with Bill Zimmerman, whom I met at last year’s Social Media Strategy Summit for Higher Education. Bill is a long time public relationships professional turned lecturer at the prestigious Donald P. Bellisario College of Communications of Penn State University. Bill is also the host of the Happy Valley Hustle podcast, which he just started this year. This podcast tells the stories of those who run their own businesses, launch side-hustles, and make the digital age work for them. It’s a celebration of challenging the old ways of doing things and sharing insights gained from success and failure. Bill actually started his podcast to go alongside a project that he makes his students do in class, so he's learning this new medium and finding a passion in podcasting. If you're interested in hearing more from Bill's episode, you can find it here. In this episode, we talk to Patrick Connor from The Digital Academy. The Digital Academy is an education management system that helps learners to achieve success by offering an individualized learning environment and by enabling engaging content that includes 21st Century Skills in Computer Science and STEM. I met Patrick at the Ohio Educational Technology Conference in February. This conference is a major event for education in Ohio and draws about 4,000 professionals to the event. Patrick was a software developer for 22 years and worked for Ernst & Young as a consultant before starting his own software development company in 2002. One of the biggest challenges that Patrick's company faced was finding skilled programers. So, he decided to start a software development class at his high school alma mater in Cleveland and he immediately saw a lot of opportunties to make things easier and more efficient for teachers in general, but particularly computer science teachers. A lot of those opportunties for improvement stemmed from legacy systems (and a lot of them). In Patrick's position alone, there were 4 different systems that teachers had to manage and input duplicate data, which he described as ridiculous. He knew he needed to simplify things for teachers. The Digital Academy is an education management system that aims to help learners to achieve success by offering an individualized learning environment and enabling engaging content, including relevant skills in Computer Science and STEM topics. But why get into such a crowded space? As saturated as the landscape is for learning management systems, the glaring there is that none of the existing systems faced students and focused on their perspectives but instead they were from the perspective of administrators and teachers. The Digital Academy partnered with the educators they were working with, along with a PhD from the Ohio Board of Education, to build something that would help students and improve student outcomes in learning. In his work with his own development company, Patrick had already created an online platform for many local companies that was being used for professional development and certifications. The base of knowledge was already there, so it seemed logical to build on that instead of trying to customize an existing solution from another developer. Getting computer programming skills is critical for students because every tech job is looking for skills like logic and understanding how computers "think" and how data is stored. Computer programming is a language, so kids can start to learn that just like they would learn a foreign language at a young age. The Digital Academy may be unique in it's focus to the student-facing interactions, but there are plenty of additional benefits to students and teachers. When using the courses offered by The Digital Academy, students can create bookmarks and notes that are stored for them in their platform. While taking tests, they interact with the program for sections that they don't understand and can have guided help that will show them additional resources and sections where the topics are covered. The Digital Academy is giving students the power over their learning. Not only do teachers get visibility to a student's progress and performance, but they have access to an extremely interactive and collaborative system that simplifies their day-to-day processes. For teachers, there is a split pane system for pretty much everything, meaning things like lesson plans and curriculums are side by side and items can be dragged and dropped from one to the other to make sure they align with the learning objectives. There is also the ability to sharing resources within school systems, so things like past lesson plans, prebuilt test questions and even tests can be shared and used to build lessons. These lessons and assignments then go directly into a gradebook and grades can be sent directly to students, which eliminates the need for double and triple entry across multiple systems. One of the most exciting features for teachers is the "Live Classroom". While most learning management systems have a "portal", TDA has an interactive, digital classroom that shows teachers what page students are on, can share documents to the entire room at once, or even share documents from students computers. All of this happens in real time, creating a seamless classroom. 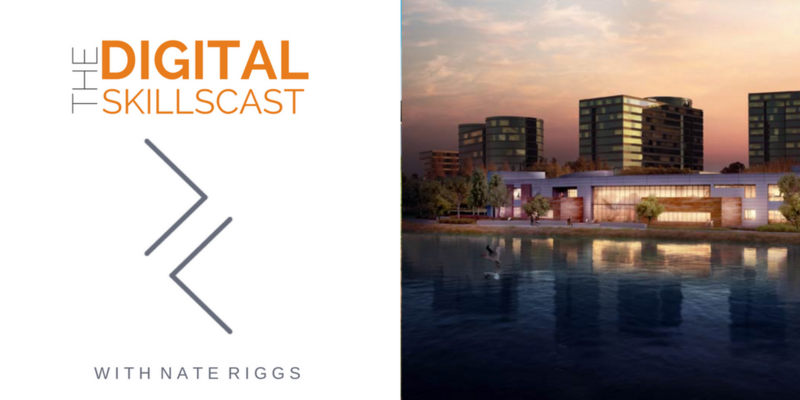 To hear more about The Digital Academy and to hear about some of the schools that are using it and how they're benefiting already, be sure to listen to this episode of The Digital Skillscast. If you want to contact Patrick or request a demo of the software, be sure to reach out via email at patrick.connor@digitalacademy.org or sales@digitalacademy.org.